Welcome to the first part of a multi-part series of articles about the cost of a Bali wedding. If all you need is just a priest or a ministrant who performs a ceremony with no decoration or anything else, then you may get away with as little as 300 USD – 500 USD. If you want your Bali Wedding to be legal and recognized in your home country, then you will need a religious ceremony and also the services of an Indonesian civil registry. Doing so will in most cases also involve you having to visit your consulate / embassy on one of the days before your wedding. Also, you will need some other official business after your Bali wedding – which will be taken care of by your wedding organizer / wedding company / wedding planner / wedding coordinator or whoever is helping you with this. Expect the cost of a Bali Wedding with a religious ceremony, civil registry and all the related bureaucracy between 700 USD – 1000 USD. Those fees can vary slightly depending on what country you are from. 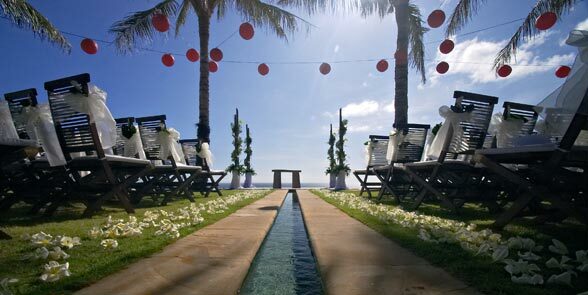 So, with 700 USD – 1000 USD you can get legally married in Bali with your Bali wedding recognized in your home country. These are the most basic components for the cost of a Bali wedding. Very few wedding companies in Bali let you book only ceremony services. Why? Because they want to sell you more. However, there is one excellent company that has been doing weddings for over 8 years that offers ceremony services only. There you can book a priest only if you like or other types of ceremony. And as far as I know they have the best prices in Bali for that. So if you want to book your wedding ceremony services separately then make sure to check out: Bali Wedding ceremony services provided by BALI WEDDING PACKAGES. Anyone charging you more for these services is probably taking you for a ride. If you are offered these services for significantly less than what I quoted here, then proceed with caution and/or be prepared for some hidden or backdoor fees. Hello! My partner and i are intending to get married in mar 2018 and exploring holding a small wedding reception for about 50 guests. We are not sure where to start and how much it would cost. Looking to hear from you! Thank you! Thanks so much for considering Bali as your wedding destination. You asked where to start. I have exactly the answer you have been looking for. Explore the article: BALI WEDDING WHERE TO START . I hope this helps. Pls let us know if you require further assistance. Me and my partner are planning to get married in the third week of March 2018 and will have around 40-50 guests. We are looking for a villa/beach wedding with a reception in the evening. My guests will pay for their stay but I want their stay on the wedding night included in the package. How much do you think I should be looking at spending? We’re looking to have just a simple and nice event with good food and excellent location. I would be more than happy to get a rundown cost of venue, hindu priest, decor, photo-video, food and drinks (most of the liquor would be brought by guests). Also I would want a wedding planner to coordinate and liaise with all the local vendors. We want a legal marriage with 10-20 people max including bride and groom. Same as Laura,we want the best way to organise this and keeping the cost down. We are planning a wedding, may i know the cost for a religious ceremony, civil registry and we will be all in package for around 50 people. with a budget of around $4,000 us. You still running this page? We want a legal marriage but it won’t be a big wedding. Probably 8 people max including bride and groom. What’s the best way to organise this and keeping the costs down? We don’t need anything big. Hi i was looking for wedding options for 10 max that nice and affordable? Please see your inbox for recommendations. I found your blog very useful, and would really appreciate if your answered. Our quote would be same as Laura’s- very small and simple legal ceremony with 8, max 10 people, including bride and groom. We having a wedding of about 10-20 people, may we also have quotes? We are also interested in a similar quote! We are hoping for a small, legal ceremony next month, ideally on the beach or oceanside. We may have 2-4 guests. We are planning a wedding in Bali, do you have any good recommendations of good company’s to use? We will be all in package for around 50 people with a budget of around $10,000 aus? Thank you so much for contacting us and for choosing our beautiful island Bali as your wedding destination! Unfortunately, you will have to increase your budget or cut-down your guest list drastically..
Hi. This has been very helpful, many thanks. You may want to discuss this with your wedding planner. Thank you for your inquiry. We have already emailed you further information. My fiancé and I are also searching for a cliff top wedding venue for 130-150 guests. Could you give us some recommendations please? it is coming in at 16 k aus dollars for ceremony buffet and drinks photographer and video..40 people. we love the outlook of nirwana..is there anywhere else comparable and more reasonable? Plenty of alternative options. I recommend you talk to an independent wedding company who can find you exactly what you are looking for and within your budget. Kindly email me about price list of the wedding package in bali. Thank you. please fill out the form at: https://baliweddingblog.com//bali-wedding-planner/ and we will get back to you. I have booked accommodation and reception already at The Sunset Hotel. We are now starting on the ceremony. We would love a beach ceremony including seating for 50, decorations, photography, hair and makeup for the bride, a complimentary drink and canapes for guests. We only have $3000us left to budget with. Do you think its doable? Thanks Heaps. Please provide the list of chapels for Catholic Wedding.